Amazon is building out Junglee into a P2P marketplace à la eBay for India. It also adds 100,000 offline sellers, giving Amazon more firepower against Flipkart, which does not have a presence in this space. However, Flipkart could potentially bank on OLX, which has market access in 40 countries, to fend of Amazon. Snapdeal has its very own peer-to-peer platform Shoppo. 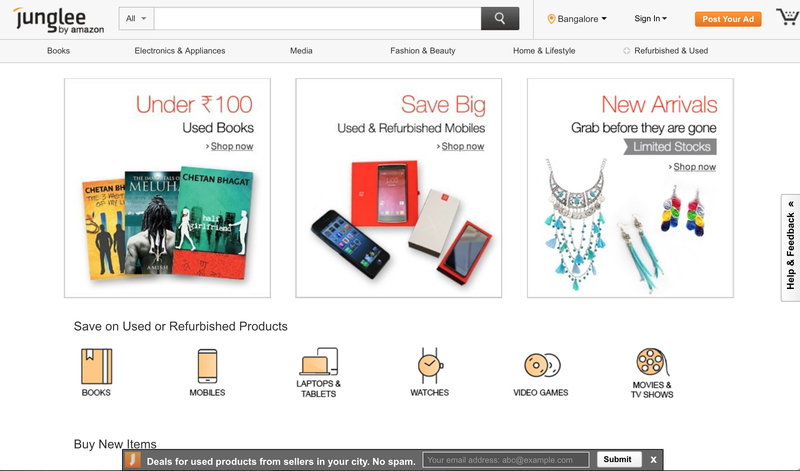 Amazon confirmed that it has piloted Junglee’s end-to-end business model in Bengaluru. “With this service we are placing a bold bet in organising peer-to-peer selling and buying in India. Customers can now use this service to create listings for free and also enable shipping and online payments through Junglee,” said an Amazon spokesperson. One could say Amazon took its time. Amazon bought Junglee in 1998. This move could help Amazon in the price-conscious market that is India. It also could help Amazon identify more easily regionally popular products. Having acquired one lakh sellers in nine months since its inception, Shopo is now targeting a 10x growth to integrate one million shops by March 2017, about four times the current number of sellers with Snapdeal.